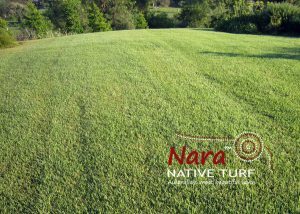 NaraTM Native Zoysia is Australia’s first native lawn variety that holds-up under the toughest of climates and is well-suited to all areas across the country. It is a low maintenance lawn that requires less mowing, edging and fertilising compared to other varieties such as Buffalo, Couch and Kikuyu. This also makes it an ideal choice for today’s busy homeowners who want a low-maintenance native lawn that maintains its winter colour. Its deep-rooted characteristics offer it outstanding drought tolerance and water efficiency as well as a high wear tolerance in both full sun and semi-shade. Its deep roots also mean it is superb for erosion control and for laying on sloping sites. In both coastal and dry inland areas, NaraTM boasts excellent natural salt tolerance.